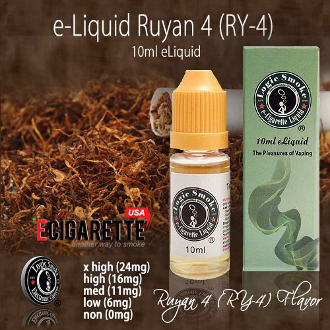 Our RY4 vapor smoke from Logic Smoke is one of our most popular tobacco flavors. It has a mild, full flavored tobacco taste with a gentle caramel undertone that will satisfy the taste buds of those who enjoy tobacco flavors as well as those who don't call tobacco flavors one of their favorites. Pick up a bottle of our Logic Smoke RY4 E-liquid and be pleasantly surprised.